Tests World > Fun > Quiz: What will my wedding hair be like? Do you want to find out what your wedding hairstyle will be? Take this quick and easy wedding test and find out what type of wedding hair you will have! Do you intend to grow your hair for your wedding? Will you do your hair yourself or will you get someone else to do it? What is your preferred style? To wear your hair up? Do you have your hair coloured? What length hair do you have? Would you like to have hair decorations? Is your hair the most important part of your outfit? Do you want a completely different look or stick to your usual? Do you like traditional hairstyles? You like the traditional hairstyles and you want a very clean hairstyle with every strand of hair in place. 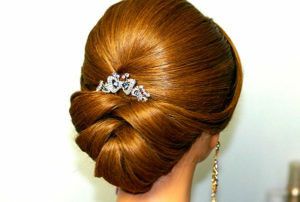 You can add a hairpiece or some sort of decoration but the hairstyle will be elegant but simple. You have very long hair and therefore there are many options for different hairstyles. Your hair is an important feature and you want it to look perfect. You add a half up half down and use a flower decoration to add some glitter to your hair. It is a very elegant hairstyle and you go for the wavy curls to finish off the look. Your hair isn’t quite long enough for an extravagant updo so you opt to have your hair down with elegant curls. 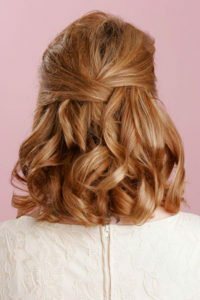 You can pin strands of hair back with pretty feminine clips to add some decoration. Your hair isn’t the most important aspect of your look but you want it to shape your face and to compliment your look. You have short hair so your options are slightly limit. However that doesn’t mean that you hairstyle is any less elegant or stunning. You take a different view on your hairstyle and you like to be different but with a feminine touch. You can decorate your hair with different head pieces and show of your creative side. You may have short hair but the possibilities are still endless. Wedding hair is an important aspect of a wedding. You want everything about your look to be perfect and your wedding hair is no exception. There are many options and some people don't know if they should grow their hair for the wedding or change it completely. Some people struggle with choosing a wedding hair style but thanks to this love quiz you can find out what will best suit your hair style! You can take this quick and easy test and find out what your wedding hairstyle is! Quiz: Am I marriage material?